Commissioned as part of dOCUMENTA (13) in 2012, The Radiant explores the aftermath of March 11, 2011, when the Tohoku earthquake triggered a tsunami that killed many thousands and caused the partial meltdown of the Fukushima Daiichi nuclear power plant on the east coast of Japan. A film essay burdened by the difficult task of representing the invisible aftermath of nuclear fallout, The Radiant travels through time and space to invoke the historical promises of nuclear energy and the threats of radiation that converge in Japan’s illuminated cities and evacuated villages in the months immediately following the disasters. The Otolith Group’s cinematic document offers glimpses into the shape and presence of an unseen entity and its abstract manifestation through visual phenomena. People To Be Resembling can be described as a five sided portrait of the methodologies of the post-free jazz, pre-world music trio Codona, founded by multi-instrumentalists Collin Walcott, Don Cherry, and Nana Vasconcelos in 1978. 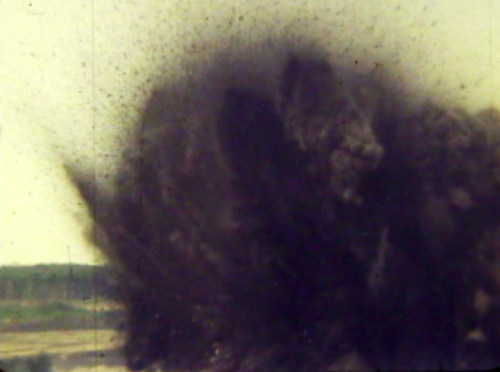 Consisting of stills by renowned photographers Roberto Masotti and Isio Saba, newly filmed and archival footage and original music performed by musician Charles Hayward, People to be Resembling reimagines the poetics of permutation that informed the sonic geography of the first Codona album recorded with ECM in September 1978. People to be Resembling returns to 1978 in order to redream the recording process at Tonstudio Bauer as a meditation upon the relations between visual anthropology, anti-colonial choreography, nuclear annihilation and Weltmusik. In its arrangement of positive and negative with colour and black and white and still and moving imagery, The Otolith Group’s People to Be Resembling stages an experiment in mnemonic cohabitation inspired by the visionary music of Codona. As Collections Manager at CFA, I love finding connections among our collections, or better yet, finding documentation of the same event spread across various collections. Whenever this happens I admittedly find myself daydreaming of filmmakers crossing paths…possibly chatting with each other, comparing cameras and stocks. 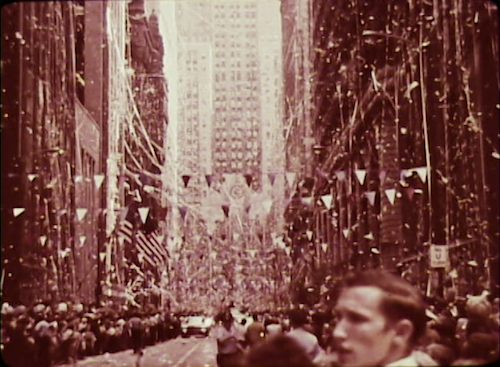 In the context of our collections, having multiple films shot on the same day of the same subject is a fairly common phenomenon for big and notable public events. Examples of this include the ’33 Chicago World’s Fair, the tumultuous 1968 Democratic Convention, or more generally, rowdy Chicago parades. 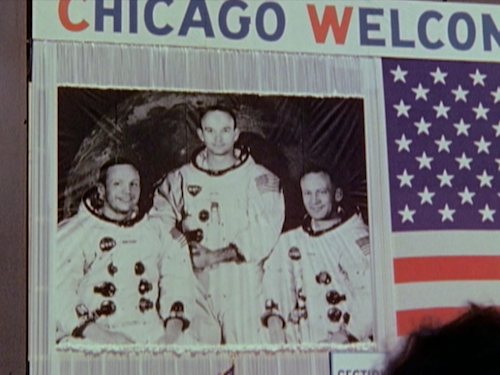 One of my favorite Chicago “same day” subjects is the Apollo 11 parade, which took place 45 years ago this month (August 13, 1969 to be exact) in downtown Chicago. 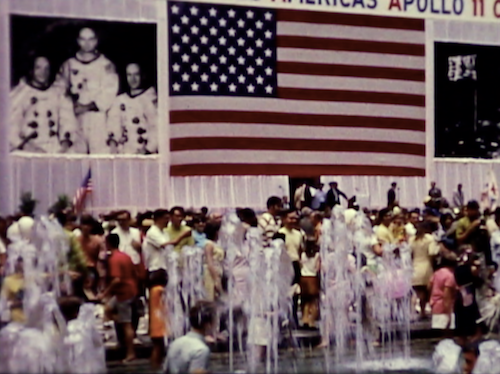 Thousands gathered to get a glimpse of the first humans on the Moon aka Neil A. Armstrong, Michael Collins, and Buzz Aldrin, Jr. To celebrate this sapphire anniversary, here are stills and films of the parade found across genres and collections…plus one special guest appearance courtesy of Tom Palazzolo! 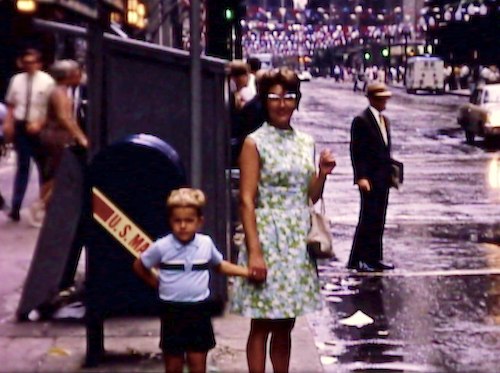 Our first example is a social-issue documentary by Dewitt Beall…. 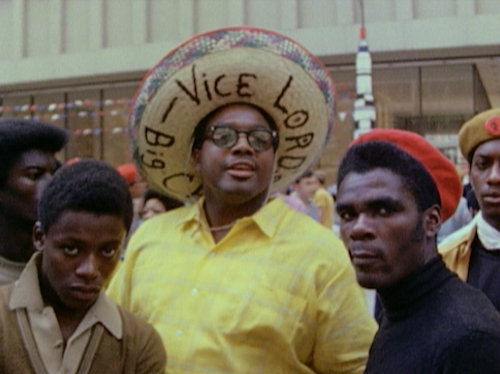 This Thursday, CFA is delighted to premiere the 16mm restoration of LORD THING as part of the Gene Siskel Film Center’s 20th annual Black Harvest Film Festival. The film chronicles the genesis and transformation of the Conservative Vice Lords, one of Chicago’s oldest street gangs. 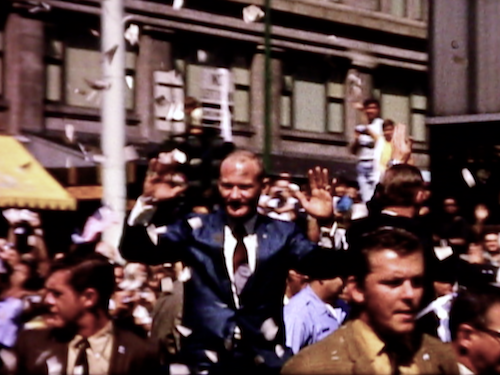 In one particular scene, an “LSD” (Lords, Stones & Disciples) coalition marches on city hall during the Apollo 11 parade festivities. 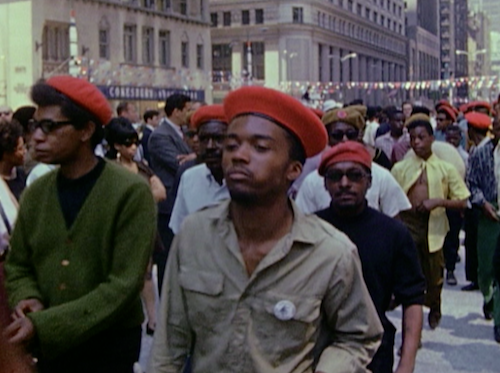 Along with LSD protests at various Chicago construction sites, the march took place to encourage the hiring of black youth for city sponsored construction projects. Unlike the other examples highlighted below, LORD THING doesn’t attempt at capturing the astronauts or parade as a whole, but rather keeps it lens tight on the LSD and their colorful berets. Now from social-issue documentary to unedited B-Roll…. 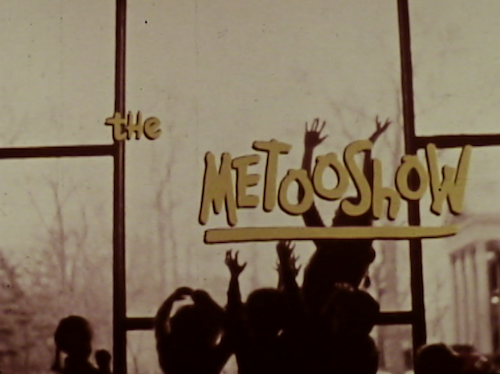 The MeTooShow was a Chicago produced educational program, focusing on children’s interactions and interpretations of the world around them. It was made by Chicago-born Gordon Weisenborn, a prolific director of educational and sponsored films (and creator of a CFA favorite, MURAL MIDWEST METROPOLIS). CFA is lucky to have a handful of Weisenborn titles in our Jack Behrend Collection, including two episodes of the Meetooshow. Unfortunately, though, both episodes are severely color faded. 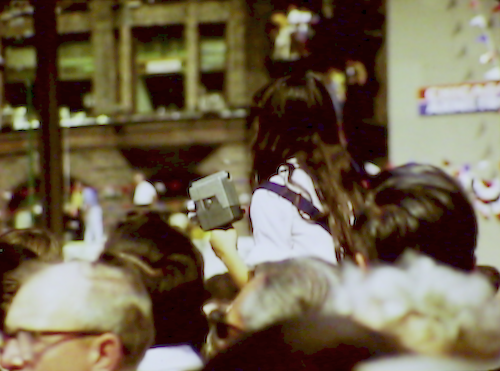 In the show’s “Where Does My Street Go?” episode, footage of the city and its people are intercut with children at play within the classroom, providing real-world examples of their imaginative play. 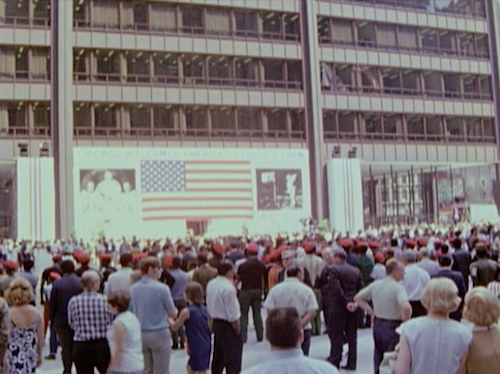 One of these city scenes features footage of our topic at hand, including shots of the astronauts and a streamer-lined LaSalle Street (pictured below with the show’s opening title card). 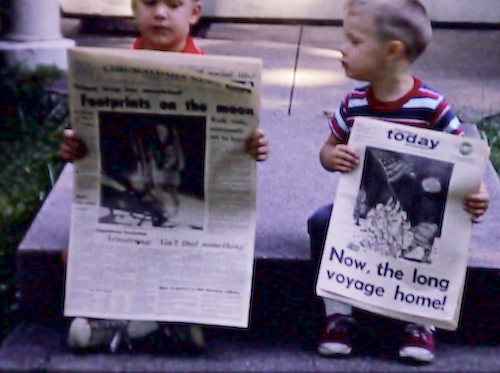 For the time being, that’s it for Apollo 11 Parade footage at CFA. We’ll continue to add to this post as we come across any additional footage. 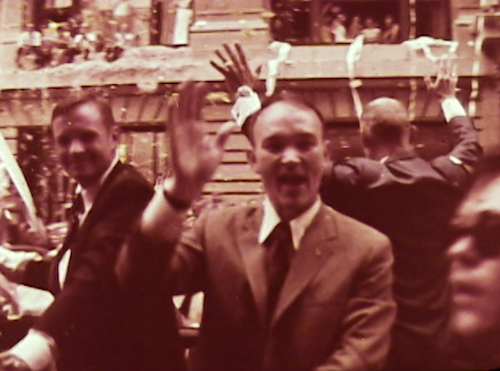 And this may be stating the obvious, but loads and loads of photographs and films (especially home movies) of the parade exist outside of our vault. I recommend checking out the Chicago Tribunes collection of photos here (the bunnies! ).